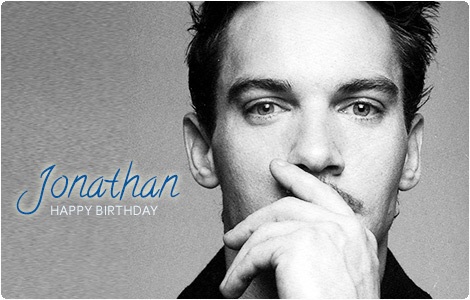 Please join the JRMfansite in wishing Jonathan a very happy 40th birthday! It’s been a wonderful year for Jonathan who welcomed a beautiful baby boy, Wolf, into his life with his lovely wife Mara. Jonathan is currently in Venice, Italy filming an adaption of “The Aspern Papers”, a novella by Henry James with “The Tudors” co-star Joely Richardson. And the new season of “The Vikings” is premiering on the History Channel November 29. Be sure to follow the JRMfansite on Twitter for all the latest updates. Stay tuned for more updates here soon, including a much needed revamp of the site. Happy birthday Jonathan! You finally got old enough for me to date! Can’t wait to see what you have in store for us in Vikings. Thanks Alyse for you post. Happy Birthday Jonathan. 40 years, Forty years, the strength of age. I wish you a dream year to come !! Happy belated birthday and thank you for for being such a remarkable artist. You are an inspiring gift to the world. Leos rule and you are the king.